Gift vouchers for the tearooms can be made out to any value. A gift voucher for the Walker's Lodge can cover any accommodation package, with or without breakfast and packed lunch. Vouchers are high quality and suitable for presentation. They can be personalised according to your requirements and are printed in full colour on A4-size paper. 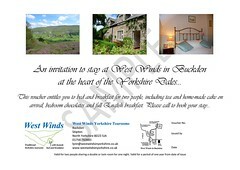 They include pictures of West Winds with full location and contact details. 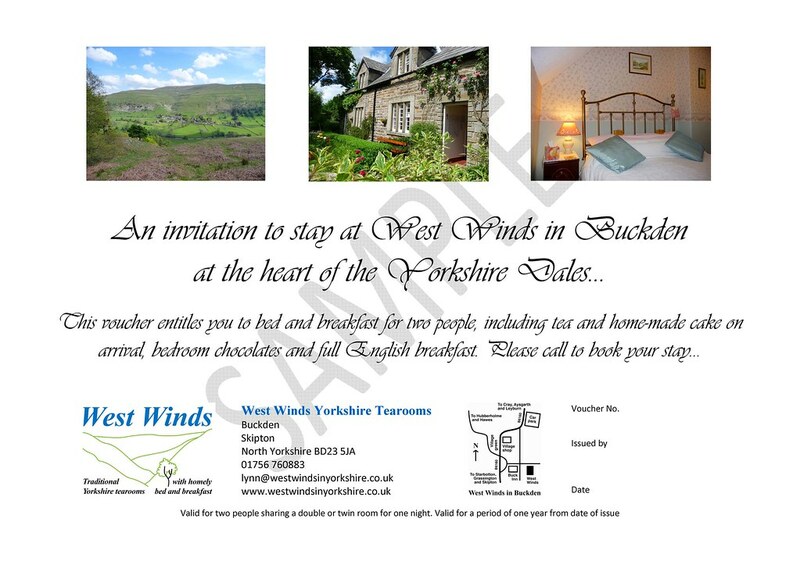 To order a voucher, send a cheque for the appropriate amount made payable to West Winds Yorkshire Tearooms, together with your instructions, to West Winds Tearooms, Buckden, Skipton, North Yorkshire BD23 5JA. Alternatively, order by email at lynn@westwindsinyorkshire.co.uk and pay through the PayPal secure payment system. Simply click on the Buy Now button below.